I first reviewed Troublemaker by Austin Hope back in January 2012 and immediately fell in love. It truly is trouble because it is so drinkable, while also being fairly high in alcohol (it has a 14.5% abv). Not only that, it’s one of those wines that I think about…that calls to me when I’m looking for a red wine that I know is going to be good, rather than experiment with an unknown wine. Sadly, though, it’s a wine that I have trouble finding in my local wine store, so while I think a lot about it,I don’t indulge in very often. 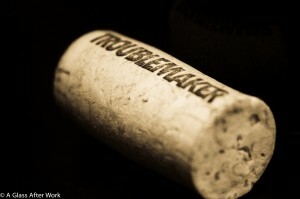 Therefore, when I saw the newest release of Troublemaker at the local wine store in Duck, I grabbed it. 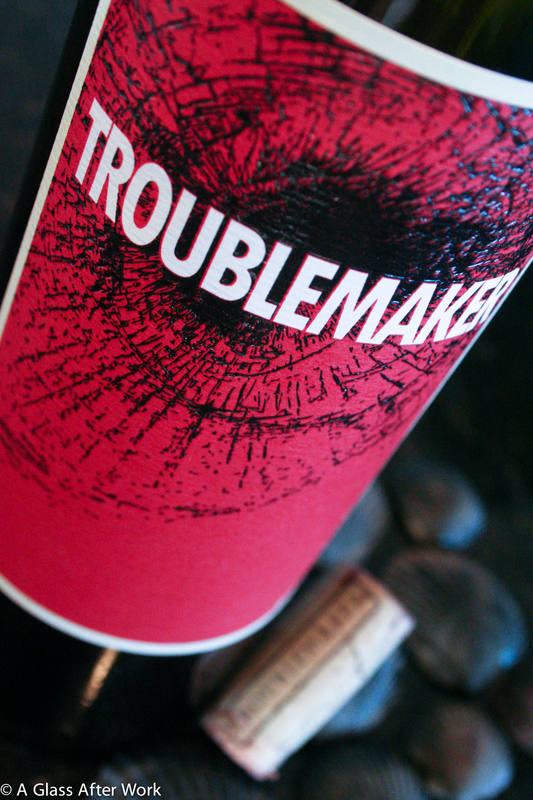 The Troublemaker Blend 6 (winery) is from Paso Robles California and is made with 50% Syrah, 20% Grenache, 10% Mourvèdre, 10% Petite Sirah, and 10% Zinfandel grapes. The wine was a deep, inky purple. On the nose, there were blackberries, black cherry coke, vanilla, and hints of nutmeg and tobacco. In the mouth, there were blackberries, cherries, vanilla, and black pepper, with hints of strawberry and cocoa powder. The wine had a medium-to-full body and tannins with medium acidity. Is this worth a glass after work? It’s worth more than one! What are you waiting for? At $20, this wine has a wonderful quality price ratio… so much so, that I’m afraid to even say that for fear that the price will increase. It’s complex, which will give the more experienced wine drink a lot to think about while drinking it, yet approachable for the more inexperienced wine drinker who just wants a good, bold red wine. The Troublemaker Blend 6 has a nice, hefty body but is so silky it’s like drinking liquid velvet. The wine goes down so smoothly that you can end up drinking the whole bottle without even realizing it. I actually first tasted this blend at the end of June because I received it as a sample, but didn’t have a chance to review it before Hubby and I headed on our summer vacation. Because I’d tasted it before, I knew when I purchased the wine it was going to be fantastic, and after the previous two days of drinking disappointing reds (here and here), I knew I just had to buy it. I’m admittedly a sucker for Rhone red blends, particularly those made by Hope Family Wines, but there is no question for me that the Troublemaker Blend 6 is another huge winner. Question of the Day: Do you like full-bodied reds or do you prefer reds with a lighter body?